A diagnosis of High Blood Pressure, HBP, or as known by its medical terms, Hypertension is never a good news to the patient. However, being aware of the condition is good because it helps the patient to modify his lifestyle. According to recent survey by the World Health Organisation (WHO), there are at least 1.13 billion people globally suffering from Hypertension. But, that is not the end of the bad news. The survey also found that incidences of hypertension had doubled in the last 40 years. Another WHO’s recent gender comparison data on hypertension prevalence further rated Nigerian adult high with 51 percent for males and 49 percent for females, followed by Ghana with 41 percent male and 38 percent female. 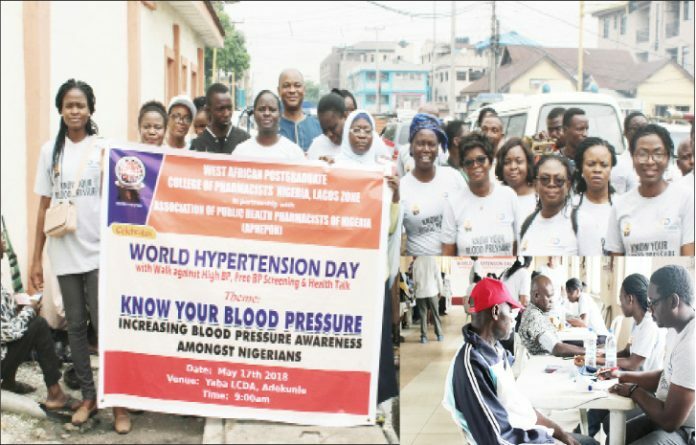 It is against this background that pharmacists marked this year’s World Hypertension Day via a walk against high Blood Pressure (BP). Dr. Arinola Joda, Publicity Secretary, Pharmaceutical Society of Nigeria (PSN) while speaking for WAPCP and APHEPON in an interview with DAILY INDEPENDENT, said that the two groups united to generate awareness about hypertension. Joda noted that since hypertension is a silent killer and do not show any symptoms till gets chronic, awareness is vital to hinder its prevalence. She reasoned; “If people know their status, BP-wise, then they are better able to protect themselves – keep themselves healthy because hypertension has been identified as a single risk factor for many cardiovascular diseases and endocrine problems. The seasoned pharmacist further explained that when people know their BP status, they will be able to seek care quickly, control their BP, and prevent these other adverse outcomes. That is why WAPCP, Nigeria chapter, Lagos zone thought it fit to organise a programme to create awareness so that people can go out to find their BP status, Joda said. Concerning the walk, she said that it was aimed at creating awareness for people to take advantage of the free screening exercise and determine their BP status. According to her, the lecture was a forum for more information about BP and other cardiovascular issues to be shared. The erudite pharmacist pointed diet and sedentary lifestyle as major contributing factors to hypertension. She said that those who do jobs that require them to sit for long hours; doing no physical exercises at all are prone to hypertension. According to her, the scenario not necessarily prevalent among the middle class alone, because even the jobs of many low-income earners are not so physical in nature, but make them sit and confined for long. The common types of hypertension in Nigeria, she said are Pre-hypertension, Stage 1 hypertension and Stage 2 hypertension. The normal blood pressure is 120/80, pre-hypertension tends to 139/89, Stage 1 tends to 159/99, while any blood pressure higher from 160/100 is Stage 2. On treatments, Joda observed that if hypertension has not developed complications, managing BP is fairly straightforward, and can be done at any secondary care facility around. She therefore recommended exercising and control of diet, noting that these are preventive measures. “For people that are in that pre-hypertension stage, the best treatment is something we call lifestyle modification, Joda also said. The pharmacists took a walk to the popular Makoko market where sellers and buyers were sensitised on the need to check their BP from time to time, so as to curb hypertension, in order to avoid an escalation of an already dangerous situation. Literary materials on heart diseases, strokes and hypertension were also distributed as part of the sensitisation. On the way to and from the market, pedestrians and road users also received sensitisation materials, and the invitation to benefit from the the free BP check was also extended to them. Ogunsanya said that they were counseled on how to maintain blood pressure.